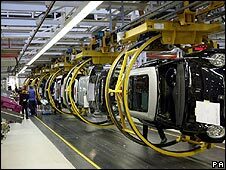 Many UK manufacturers face an 'uncomfortable' time, the CBI says. The CBI, the UK's largest employers' organisation, has warned that the UK economy is deteriorating faster than it previously thought. There was "no doubt that the mood has darkened in the last two or three months," its director general Richard Lambert warned members in a letter. Forecasters, including the CBI, had been "over-optimistic" about the economic outlook, he added. High inflation and slowing growth have prompted fears of a possible recession. The level of inflation - which most analysts expect to surpass 4% when the July figures are released this week - had taken people "by surprise", Mr Lambert said in the letter, seen by the BBC. And he added that the credit crunch had been "bigger and broader" than first expected. "A year ago it seemed reasonable to hope that the worst would be over by now. That has not turned out to be the case." Economic activity is slowing in all key sectors of the economy, business confidence is waning and falling house prices and tight credit conditions have dented consumer spending. "This is why most analysts are now suggesting that the economy will at best only manage to stagnate in the coming few quarters, and that the growth prospects through 2009 and into 2010 look no better than anaemic," Mr Lambert said. The CBI earlier cut its forecast for growth in 2009 from 1% to 0.4%. And last week the International Monetary Fund again revised down its forecast for UK economic growth this year and next year. It now expects growth of 1.4% this year and 1.1% in 2009, although the government still expects the figures for both years to be 2% or above. "The CBI, along with most other forecasters, has been consistently over-optimistic about the economic outlook over the last 12 months," Mr Lambert added. He added that there were still many companies who were doing well - especially in the manufacturing of high value items. But he conceded that it was going to be an "uncomfortable time" for many. "A sharp economic slowdown is a new experience for many people in government and in business," he said.